We can always find puzzle pieces for our art projects. You know how sooner or later a piece or two of our favorite puzzle turns up missing. We hate to throw the whole puzzle away, but the trouble is, it’s hard to find projects to use them in. So, here’s one cute way to use them. I’ve included a body pattern with this project, but in order to get some differing expressions, the eyes, beak and wattle are made by the individual from colored scraps of red and yellow paper. 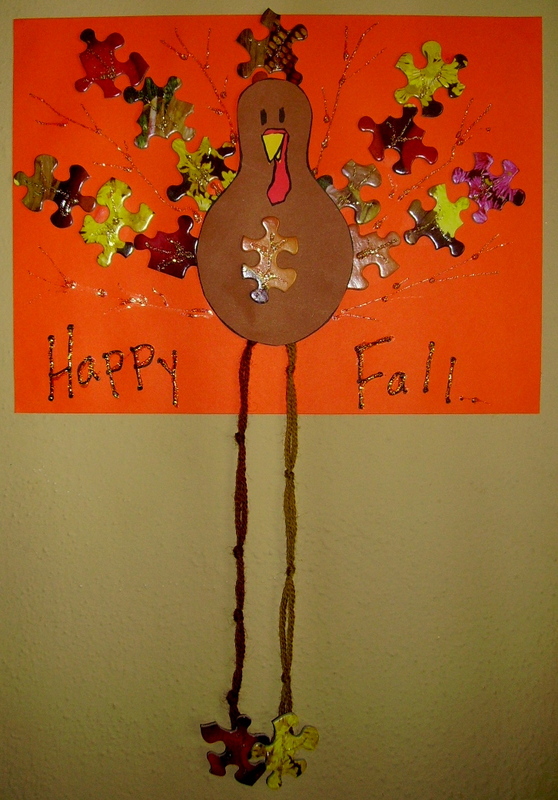 “Happy Fall” is found under the 4th Grade Projects Gallery in the sidebar. This entry was posted in 4th Grade, Thanksgiving and tagged 4th grade, art and crafts for kids, crafts for thanksgiving for kids to make, fall, happy fall, projects for thanksgiving, puzzle pieces, puzzle pieces used in crafts for kids, thannksgiving art and crafts, turkey. Bookmark the permalink.